After all my exertions yesterday procuring the family chocolate supply, my husband had been patiently waiting at home for some dinner action. 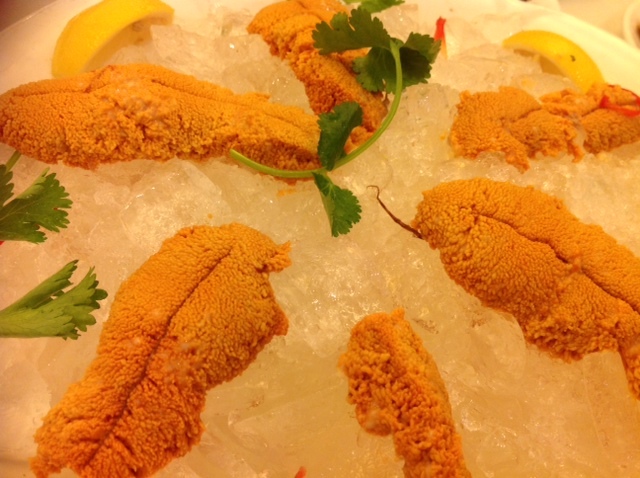 We went to our favorite Chinese restaurant- the Asian Pearl in Pacific East Mall. It's the kind of wedding banquet dimsum Chinese restaurant where they have live tanks and the experience is good only if you go for adventure. Since our other goto Chinese restaurant burnt down last year, we come here more often. Lo and behold- I happily noticed giant sea urchins. They serve it three ways- raw, steamed with egg custard, or in fried rice. 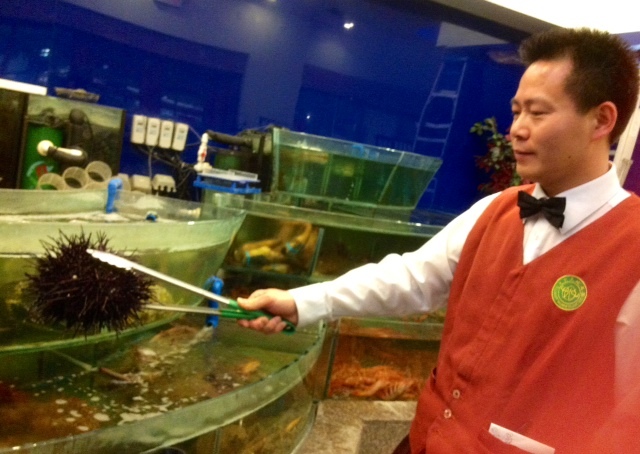 To a Korean- live urchin should be prepared only in one possible way! After my first bite- so sweet and creamy- I vowed this is THE only way I am going to enjoy my uni hence forth. No more pre-killed pre-packaged urchin gonads in wooden boxes for me! From the lemon slices above, you can see that's a lot of gonad from a single critter. Despite the numerous opportunities for harvesting and eating urchins in the wild while snorkeling- I've been quite weary to touch urchins at all. I regretfully stepped on a recalcitrant urchin in Bonaire- having an urchin spine stuck and removed from a big toe can quite ruin the fun for the entire day I assure you. My toes quiver at the memory. 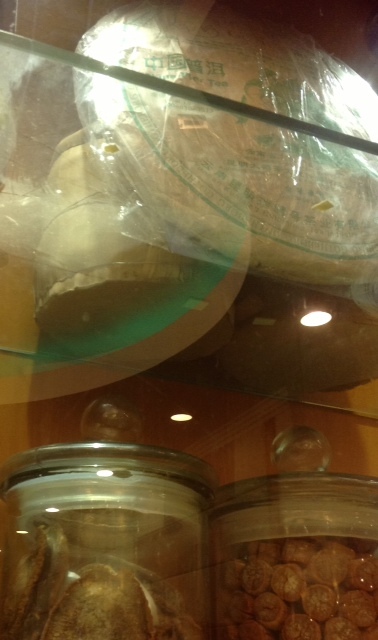 This restaurant also has a cabinet of treasures which holds a giant 14 inch Gotheberg beeng and two mystery tongs. Of all the inappropriate places to store puerh- this has got to take the cake! 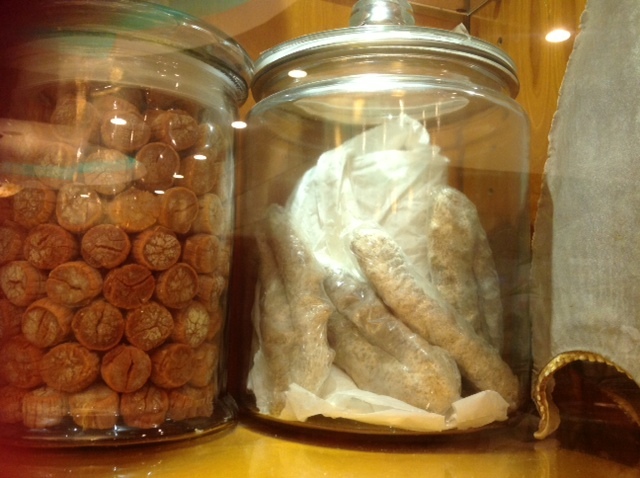 Well for starters there is an unwrapped dried sharkfin on the shelf below along with a jars of dried scallops and sea cucumber. Can this puerh escape a sea aroma of supernatural pungency just with a single layer of Saran Wrap? I wonder if those cakes will ever be drunk. Puerh is not on the menu. 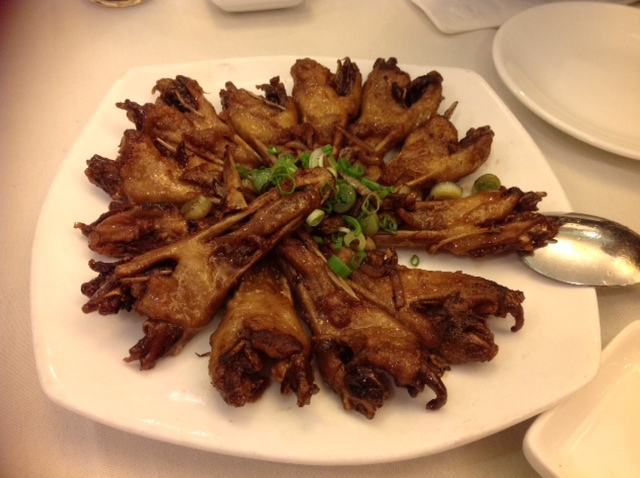 We also enjoyed the underrated but absolutely delicious delicacy of duck chins which I prefer to a plate of duck tongues. The chewiness of the jaw and tongue with some cartilage makes it far tastier. The last time I was here, I had spied on the dessert menu something I've never heard of before- hasma with boiled milk. The waitress said she knew what it was but could not explain it. So I didn't risk $8 on something which defies simple explanation. Hasma is a special fat covering the ovaries of a frog occurring at a special high season. It's harvested and dried and reconstituted in dessert like bird's nest. As hasma has little taste, it's for nutritional benefit that hasma has a place in Chinese cuisine. I had greedily gobbled down so much uni- I made myself quite sick and had to defer hasma for yet another day. But all in all- I'm grateful such a restaurant is so near. Yesterday, my mother face-timed me with serious worry lines in her lovely face. The cause of my dear mother's anxiety was recent findings by the KCA(Korean Consumer Agency) on unacceptable levels of pesticides in some Chinese teas labeled as organic. So as a public service announcement triggered by my mother, I alert you the reader about the below brand of organic puerh which was found to have Bifenthrin (0.02 mg/kg) and Cypermethrin (0.49mg/kg). I didn't recognize the wrapper as one of my own or any I've ever seen for sale. I think Youji means organic and the front says something like 100 Years Era. The news reports that other expensive organic labeled teas including jasmine tea were shown to contain goodly amounts of pesticide. So upon being presented with this unpleasant news, what's a tea lover to do. I really don't want to accumulate potentially carcinogenic neurtoxins in my fatty cells although environmental impact from the usage of such insecticides is the greater evil. What are we to learn from this alarming news? The organic label does not always mean much. I guess rinsing your tea is critical. Which middleman or middlewoman can bridge this gap sourcing directly from reputable farmers? I was always dubious about a scene where David Lee Hoffman rejects teas in "All in this Tea" by just a single whiff claiming that the farmer used pesticides. I think most teas on our markets may not have such strong indicators as such tea would be weeded out by the consumers. I am liable to forget all this and drink tea as I have always done. After the Dai Fukushima nuclear blowout, I had vowed to avoid all new tea from 2011. But after even a short while I drank random sencha at sushi restaurants without a second thought. 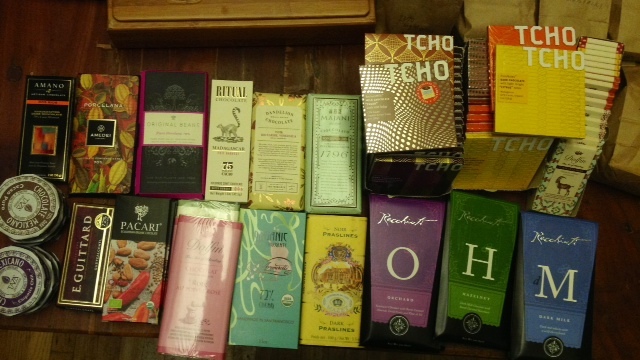 A friend and colleague visiting from London gave occasion to sweep the chocolate shops of San Francisco. I had joined him on some exceedingly grueling stints in South Africa which were made a pinch more cheerful with a daily dose of quality chocolate. My friend has hands down done some of the toughest gigs for my company including Luanda, Angola. Although my other friend R might believe Angola to be much more palatable than Nigeria where he was nearly had by rioting truckers, it's hard to weigh harsh conditions such as lack of running water in Luanda against simmering Nigerian violence. R said that every morning he rode in a military convoy to get to work and the military body guards would jump out of the car and whip pedestrians and other drivers in the face with a leather flog tipped with metal balls. Such ways of dealing with the traffic are not allowed here no matter how badly one may desire to deal with certain stoned drivers. I also could not wish to choose between either situation and only one colleague can claim to have been kidnapped for ransom- by the local police no less. My role has let me travel out of my own choosing so I have stuck to the more genteel nations of Europe and Asia. But whenever my friends reminisce about the dodgy corners of the world, I feel a twinge of regret. Regardless of the location, client work for my company tends to be brutally grinding. But I can truly say working along side such colleagues under bone crushing pressure has been the happiest moments of my entire career. I modestly planned to hit 3 stores and a factory but we somehow managed only the first half as my backpack was fully laden. We started at the southern most part of our journey in Noe Valley with plans to walk north to the Tcho Factory at Pier 17. Our first visit was "Chocolate Covered" which I believe can boast having one of the most extensive chocolate bar selections in the Americas. I was happily reunited with Amano's Dos Rios which has curiously a natural bergamot flavor. Friends and my husband say they cannot tell but if you are a constant Earl Grey drinker like me- the bergamot flavor is unmistakable. The owner is undoubtedly a music loving chocophile. He let me taste some of the bars before buying. I am simultaneously regretful and thankful this store is not near me. The big issue of course is the expense. For someone like me that buys in bulk, the boutique up-charge is a serious factor. For the first time in decades, I actually had to deny myself at a chocolate shop. I could not bear more than 5 bars- the Amadei Porcelana cost $20 alone. I'll be saving my money from now on so I can march in there and fill my basket with impunity. To find relief, I took my friend to Rainbow Coop who was appreciative of the idea of a vegetarian grocery store. 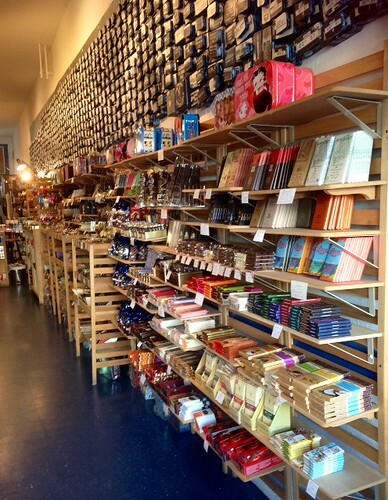 Rainbow has some of the best prices for San Francisco chocolatiers but they also carry lesser known brands Majani and Mazet. I greedily loaded up my cart with 80 bars. I'm preparing for Valentines but I also neglected XMas duty and have an ever growing backlog of chocolate distributions. 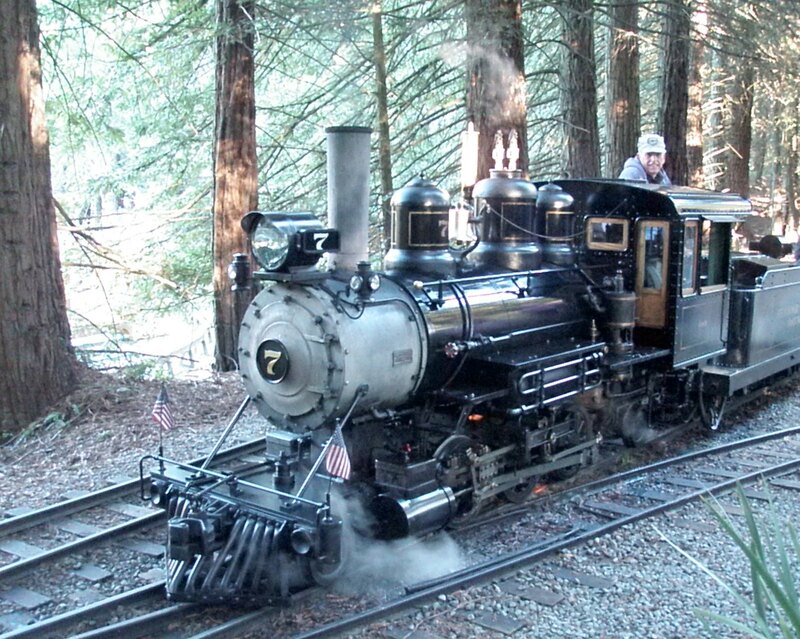 At the end of our exertions, we were treated to an uncommon sight. 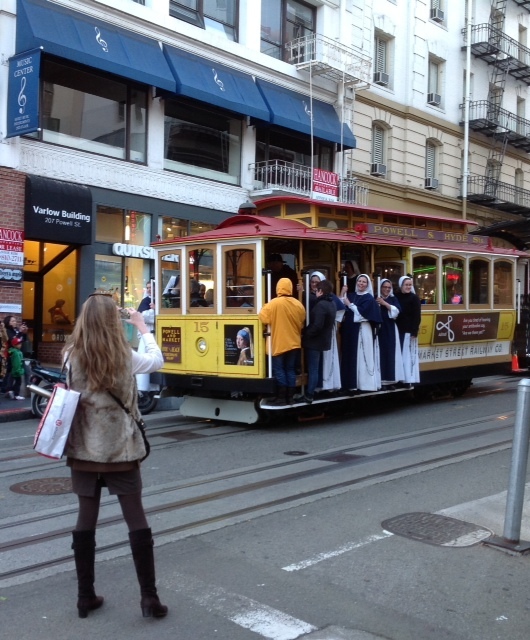 Nuns on cable cars had created quite a sensation and numerous passerby's were excitely snapping photos. They were genuine bona-fide nuns- not just a gang of unruly men in drag playing up a "Sound of Music" theme which is a more common sight in SF. I loved it that the nuns looked like they were having a grand old time. Go sisters! I have a pathological history of choosing inappropriate teapots. But such faulty proclivities are infinitely preferable to choosing inappropriate men. My biggest regret ia a century old Wedgwood basalt jasperware teapot- I do not know what impulse seized me to buy such a dark and dreadful thing. It's too large to make decent tea. Like you, I make very poor decisions late night on ebay when I've repeatedly lost on treasures my heart really desired. Thank god I married my first choice of men then! With my last tea order I included multiples of a tiny porcelain rong tian shaped teapot. After heartbreaks over chipping and cracking many a spout, I decided to treat teapots as consumables. These teapots were cute, cheap and tiny and for $5.4, they are not so bad. I tried one for work today and it's a fiddly affair- the hole on the lid is too tiny so it overflows when pouring. I have to open the lid to pour and the stingy spout takes forever to drain. I've been trying fiendishly hard to make my new work setup more conducive to serious tea drinking. I can't seem to get used to the overly modern design of the space at all. Our new digs has twenty foot ceilings which make a hobbit like myself inherently uncomfortable so I try to hide behind a lot of foliage. 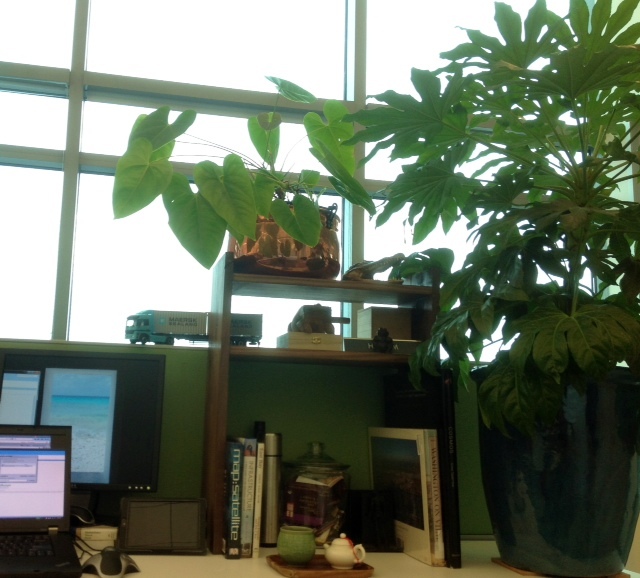 Although not visible in the photo, there is a little Frodo climbing the Fatsia stalk. A rainy and cold January night can be cheered right up with a toasty heating pad, a copy of McMafia: A Journey Through the Global Criminal Underworld and a delicious cup of tea. After binging on four volumes of Jane Austen, I need to fix such useless romantic inclinations with gritty tales of the Bulgarian mafia. Although yesterday's Waishan Xiaozhong is a much better match for the macho doings of entrepreneurs with a criminal bent, I settle on the 2002 Anxi Tie Guan Yin hoping the caffeine content is just enough for evening reading. This aged oolong has been baked but once a decade ago. The first two brews present a pleasing vanilla and honey taste but the subsequent brews get progressively more acidic, bitter and even a bit sour. Yet another reference point for aged oolong. These single farmer's batch are always a gamble. My prior dinner of North Indian curries probably left my palate not ideal for delicacy. The better versions of aged oolong I've been privy to thanks to MarshalN tend to brew progressively mellower and sweeter. Perhaps this Anxi oolong needs another decade or two to ease in. I'm willing to wait with the two other vacuum packed mini-bags of 7g each. It's too late in the night to brew other aged and non aged roasted oolong for comparison. Ira sent me home with samples of MarshalN's curated oolong so I definitely have fun oolong homework which I am saving for my 10 day island break next week although the tea making situation has not been entirely cleared yet. 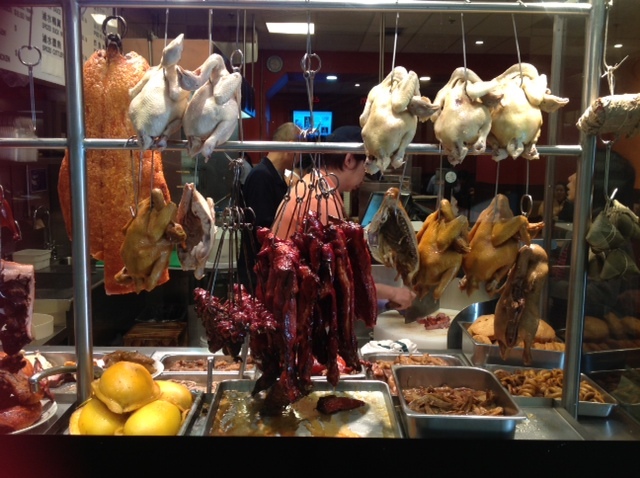 The above storefront is my favorite meat joint in Oakland Chinatown called Gum Kuo. I have the exceedingly good fortune to walk past it almost everyday to work. I stopped there this morning to get a healing bowl of juk/congee with preserved egg and salted pork. There is a similar roast meat shop right next door but somehow, Gum Kuo has all the flavor. When I had abandoned hope for anything exciting happening to me this rather dreary winter afternoon, a box from Kunming arrived an hour ago. 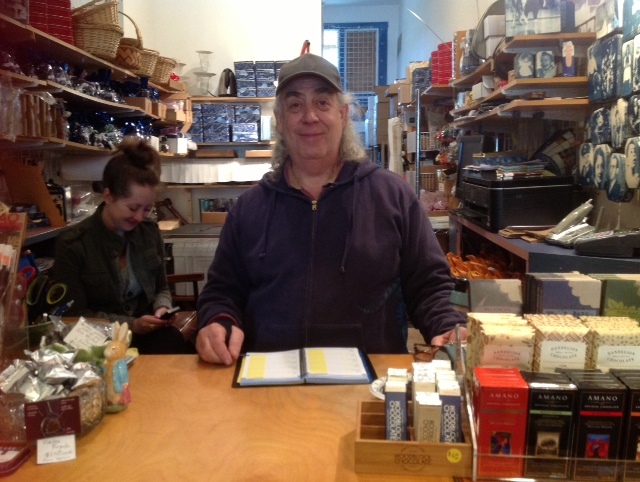 I had hastily ordered some tea right before the New Year in case I was going to stop buying tea in 2013. I think not. "tears of happiness appear in my eyes (almost)." I am certainly a sucker for such emotion inducing tea. I ordered both the Waishan Xiaozhong(外山小种) as well as the premium Zhengshan Xiaozhong(正山小种). XiaoZhong(=Souchong) indicates a smaller leaf variety of tea bush. The Waishan designation indicates that it was produced outside the traditional LS producing TongMu village while Zhengshan indicates genuine TongMu origin. The vendor description seemed to indicate that this Zhengshan had yet even smaller leaves and more buds although both were labeled as being grade AA. You can read the full history and naming clarification from hojotea who also adds that sipping whiskey alongside LS is a flavor party in your mouth not to be missed. Whether or not Sir Winston Churchill really did mix his LS with scotch, I'll have to try the said blend myself. I even found a vendor who ages LS in rye whisky barrels. Due to the smoking process, LS can be aged up to a point which tickles my hoarding impulses. Yes! Yes! Both are delicious teas worth drinking and sharing. No one need fear offending anyone with these two mellow Xiaozhongs. This Zhengshan does not disappoint as a refined delicate tea and I'm exceedingly happy that I can at least taste something of that dark dried Turkish apricot over my sore throat. I cannot attest to the famed dried longan flavor since I've not had the pleasure of dried longan, only fresh. Both teas leave a lingering sweetness on the front half of the tongue; the smokiness is so subtle that one would not know this tea was any relation to the grossly smoked LS one is commonly assaulted with. The Waishan Xiaozhong provides a more vigorous fuller maltier beany cacao taste. I'm beaming over the juiciness of this tea and at $8 per 100g and even with added shipping, it's a treasure. I immediately declare Xiaozhongs to be the official house hongcha. But my husband just lets that fly as there are almost weekly such announcements. Last week I declared Himalayan salt to be the official house salt for 2013. I'll be giving dianhongs a rest as I've gotten tired and even slightly contemptuous of their reliable smooth taste. I believe myself to be cured or at least granted a reprieve by Xiaozhong of all teas. Happy belated new year to you! I often am a laggard and wait for the Chinese Lunar New Year to reform my ways and start anew. I've taken a brief hiatus as I can't seem to rub two cheerful sentiments together these days and have neglected much of my social obligations to hide under a blanket. But having taken an hour long train ride to visit the indomitable Ira has given me some strength to write today. I am pathologically unable to review any teas at the present time so I turn to a temporary diversion. There is but one holiday I actively take a lead- I am constantly prodding my male friends and acquaintances to engage in some advance planning to surprise and delight their partners. More than a few resent the commercial nature of Valentines but how can one be against celebrating the one emotion for which modern definitions of happiness relies? As the movie version of Edmund Bertram in Mansfield Park comments, "There are as many forms of love as there are moments in time." Romantic love is but only one narrow sliver of our love lives as love can flow in so many directions. But my tea life meanwhile has been a life-long romance gone awry. Tea drinking which has always brought sparkle, stimulation, solace and balance to my life is now reduced to quenching a minimum thirst. The few times I've tried to drink my favored teas I am left curiously unfeeling. I know it's me not the tea. Even with so many excellent teas before me, I've been indiscriminately drinking stale sencha and even bagged CTC teas. Where can a tea drinker turn to when tea no longer acts as the substance of existential relief? I think I've hit some sort of rock bottom as I find myself hiding under a blanket uncharacteristically immersed in Regency England with Jane Austen. One of the chief frustrations with reading Jane Austen is that her characters are often having tea but she spares nary a word about the quality and taste of the tea. Jane Austen is decidedly not a hedonist but she knows much about the workings of the human heart. I fancy myself a keen observer of the human heart and I always wonder among acquaintances and even strangers the nature and level of the bonds existing between two humans. I like Emma Woodhouse delight in finding hidden or unexpressed love that needs encouragement. But alas it's me and my tea drinking which needs a reconciliation and a restoration.